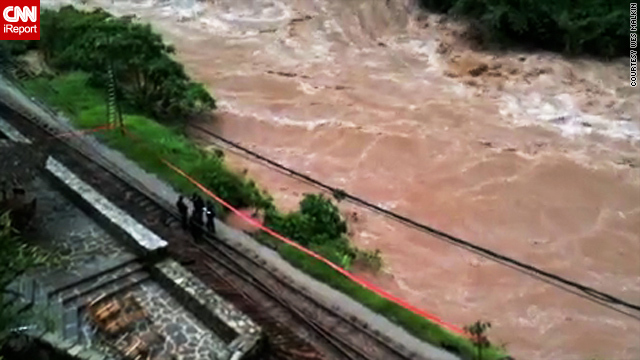 An image shot by iReporters stranded after floodwaters cut railway lines. (CNN) -- Clayton Fredrik is standing in the distant shadow of the Incan ruins in Machu Picchu, battling boredom and helping locals repair flood-damaged roads. One of many foreign tourists stranded in the town at the base of the fabled Peruvian site since the beginning of the week, the 24-year-old Dutch man from Amsterdam has been twiddling the time away before a helicopter flies him off -- hopefully in a day or two. He's passing the hours by chatting with others in and around his hostel in the town of Aguas Calientes, going to an Internet cafe and helping the locals repair flood-damaged streets in an atmosphere he describes as "pretty calm." The only inconvenience for him is not being able to use his credit card at businesses such as restaurants, but he expects to get to the capital city of Lima in time to leave for a jaunt to Africa "if everything goes well." "We're just bored," Fredrik told CNN. The predicament for visitors to the popular region has helped redefine the phrase "tourist trap." Heavy rain unleashed mudslides that cut off roads and blocked a rail line between Cusco and Machu Picchu, leaving hundreds who came to visit the ruins trapped in Aguas Calientes or on the nearby Inca Trail. Helicopter evacuations have been launched. Peruvian officials said nearly 600 people were evacuated Wednesday and they hope to airlift out between 800 and 1,000 more on Thursday. Authorities have estimated that 10,000 people have been affected by the rain and 2,000 homes were ruined in and around Machu Picchu. News reports said at least seven deaths have been reported. According to Fennell, Peruvians said that by 3 p.m. Thursday they moved out 1,000 people and should be taking out more by the end of the day. A few hours later at the State Department in Washington, spokesman P.J. Crowley said "perhaps as many as 125 Americans are still in Aguas Calientes." He said two more U.S. helicopters had been added to the effort, bringing the total to six. The evacuation efforts will continue Friday if the weather holds, officials said. Tom Molyneaux of the United Kingdom has been in the area since Sunday afternoon. He said the town "is basically surrounded by a big river which has burst its banks." He said people who weren't lucky enough to get space in hostels have to sleep in a train station and other buildings. But he said local residents have been "brilliant" as they worked to give tourists food and water, and he said tourists are helping locals rebuild roads and stave off floodwater. A couple of buildings have collapsed and at times there have been power outages. Molyneaux, 26, said there is a strong police and army presence and there have been regular evacuation flights. "The authorities are doing all they can, from our point of view," he said. He said authorities first gave evacuation priority to people such as the elderly and the sick, and now "are working their way through" the rest of the people, including able-bodied young men like himself. He expects to remain in town for a couple more days before he is ferried out. Meanwhile, the U.S. Embassy in Peru was attempting to send helicopters to Aguas Calientes to help remove Americans to support Peru's efforts. Air operations could be challenged by rain, fuel shortage and the high altitude, the embassy said in a message on Wednesday -- when there were still about 200 Americans around Aguas Calientes. More rain is expected through Friday, though less than what's already drenched the region. A state of emergency has been declared in southeastern Peru, which includes Machu Picchu, according to Javier Velasquez, the president of Peru's Council of Ministers. Machu Picchu is an ancient city on a mountain in the Andes, standing 2,430 meters, or nearly 8,000 feet, above sea level in a tropical mountain forest. Known as the "Lost City of the Incas," Machu Picchu is a UNESCO World Heritage site and draws tens of thousands of international tourists every year.